Microsoft SQL Server has many security features available within the database, but until release of SQL Server 2008 there has been no “out-of-the-box” method for protecting the data at the operating system level. The Transparent Data Encryption (TDE) feature introduced in SQL Server 2008 allows sensitive data to be encrypted within the data files to prevent access to it from the operating system. It solves the problems of security of data means encrypting databases on hard disk and on any backup media and is the best possible choice for bulk encryption to meet the regulatory compliance or corporate data security standards. This feature encrypts both data and logs as the records are written to SQL database files (*.mdf) in real-time, including backups, snapshots and transaction logs. TDE encrypts data before it’s written to disk and decrypts data before it is returned to the application. The encryption and decryption process is performed at the SQL layer, completely transparent to applications and users. TDE encryption uses a Database Encryption Key (DEK) (that is an asymmetric key secured by using a certificate stored in the master database), which is stored in the database boot record for availability during recovery. In this post, I’ll show you how to encrypt database using Transparent Data Encryption (TDE) and then I will discuss the limitations of TDE. 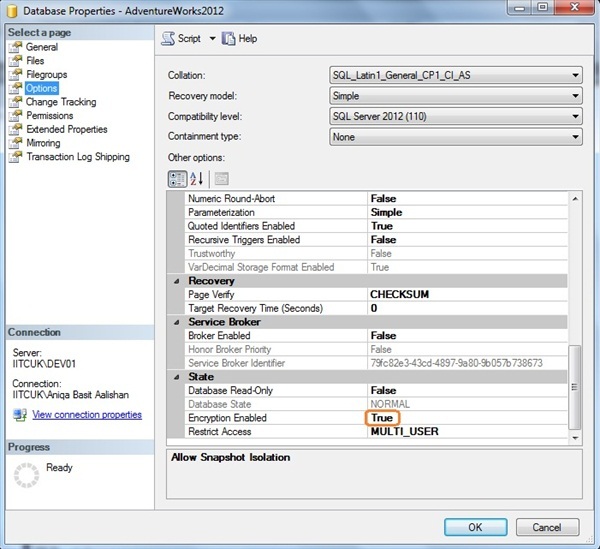 Service Master Key is created at a time of SQL Server setup; DPAPI encrypts the Service Master Key. 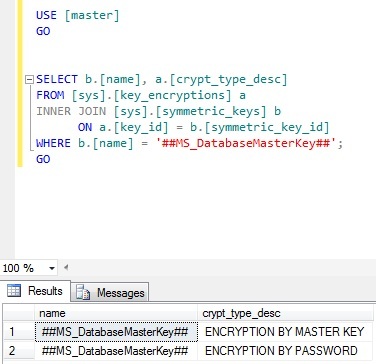 Service Master Key encrypts Database Master Key for the Master Database. The Database Master Key of the master Database Creates the Certificate then the certificate encrypts the database encryption key in the user database. The entire database is secured by the Database Master Key of the user Database by using TDE. TDE performs the encryption at the page level. The pages in an encrypted database are encrypted before they are written to disk and decrypted when read into memory. 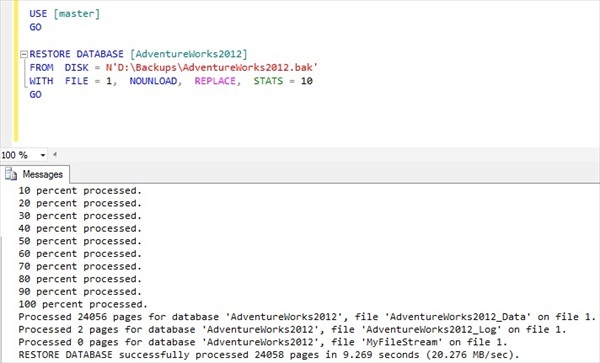 Note: For the purposes of this post, I’ll be encrypting SQL Server 2012 sample database AdventureWorks2012 database using TDE. It is advisable to backup the database prior to implementing TDE. Now the next step is to create a self-signed certificate that is protected by the database master key of our master database. 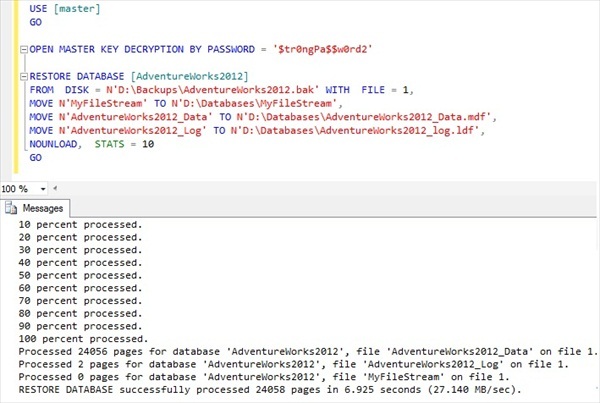 This certificate encrypts the Database Encryption Key in the AdventureWorks2012 database. Note: Certificate expiration is not enforced when the certificate is used for encryption. -- Master key password must be specified when it is opened. Note: Save your master key and security certificate backup files in a secure location as you’ll need them when restoring the database on a different SQL Server otherwise the restore process will fail. Now that we have created the database master key and the certificate in the master database, we are now ready to create the database encryption key for our database. The AES_128 option specifies Advanced Encryption Standard (AES) with a 256 bit key length, and we protect the database encryption key with the AWTDECertificate certificate that was created in the Master database. Note: SQL Server allow you to encrypt data with several encryption algorithms such as DES, Triple DES, TRIPLE_DES_3KEY, RC2, RC4, 128-bit RC4, DESX, 128-bit AES, 192-bit AES, and 256-bit AES. The final step in the setup process of TDE is to enable it. This is accomplished by executing the ALTER DATABASE command with the SET ENCRYPTION ON argument. As you can see from above that database restore is successful on same instance. This is because the database is encrypted with TDE. 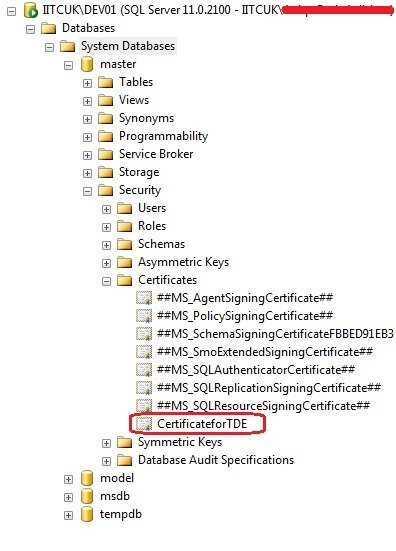 To restore the TDE encrypted database on different SQL Server instance, you first need to restore the database master key and then the self-signed certificate that is used to encrypt the database encryption key. We are now ready to restore the database on second SQL Server. Note: You must OPEN MASTER KEY first and then perform restore otherwise restore will fail. TDE does not provide encryption across communication channels. 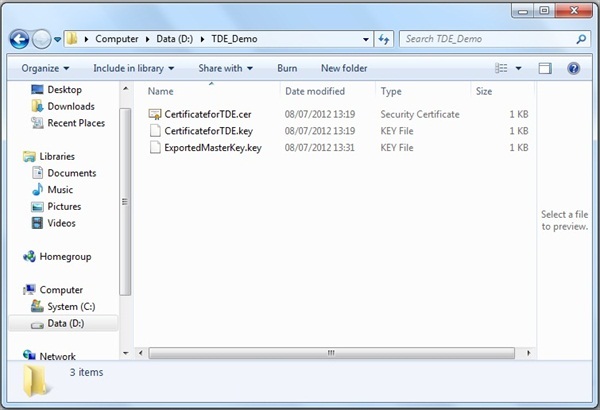 When enabling TDE, you should immediately back up the certificate and the private key associated with the certificate. If the certificate ever becomes unavailable or if you must restore or attach the database on another server, you must have backups of both the certificate and the private key or you will not be able to open the database. The encrypting certificate or Asymmetric should be retained even if TDE is no longer enabled on the database. Even though the database is not encrypted, the database encryption key may be retained in the database and may need to be accessed for some operations. Altering the certificates to be password-protected after they are used by TDE will cause the database to become inaccessible after a restart.